We offer a large selection of Shoe and Boot Protection. You can search many types of Shoe Covers, Clear Poly Boots with tie Strips and Fluid Impervious Poly Boot Covers. 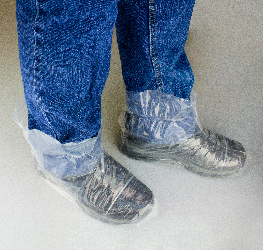 Disposable Poly Shoe Covers are made of a blue spun bonded poly material. These non-conductive shoe covers with elastic band slip on easily and are available in regular and non-skid styles. The elastic band helps to keep them in place while walking. 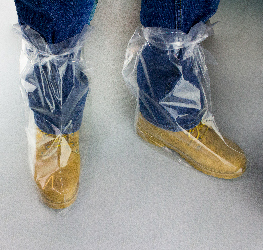 Clear Poly Boots with tie Strips fits up to size 10 have an inexpensive, disposable boots protect footwear from spills. Slip on and secure with attached tie strip. 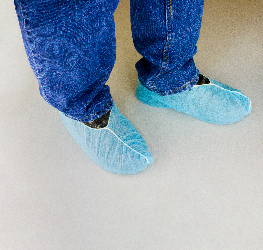 Fluid Impervious Poly Boot Covers reduce the risk of infection from potentially hazardous liquids. The boot covers slide easily over boots. Once boot cover is in place, use tape or rubber band to secure.